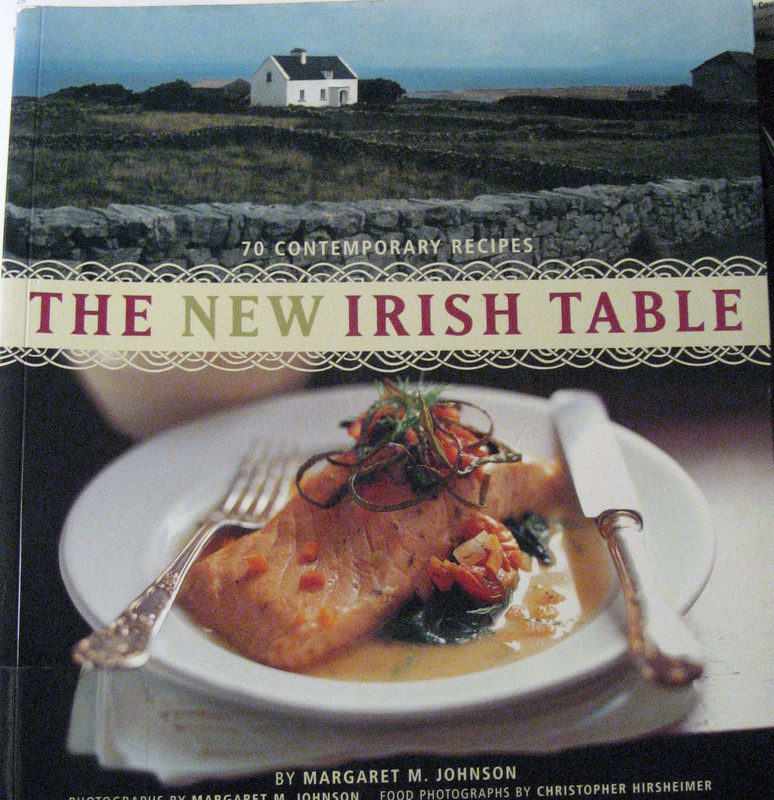 Margaret M. Johnson has put together several beautiful cookbooks, all with an Irish theme. Each cookbook is full of photographs of the Irish countryside along with mouthwatering pictures of the recipes. If you are at all interested in Ireland, or Irish food, these are a must-see from your local library. 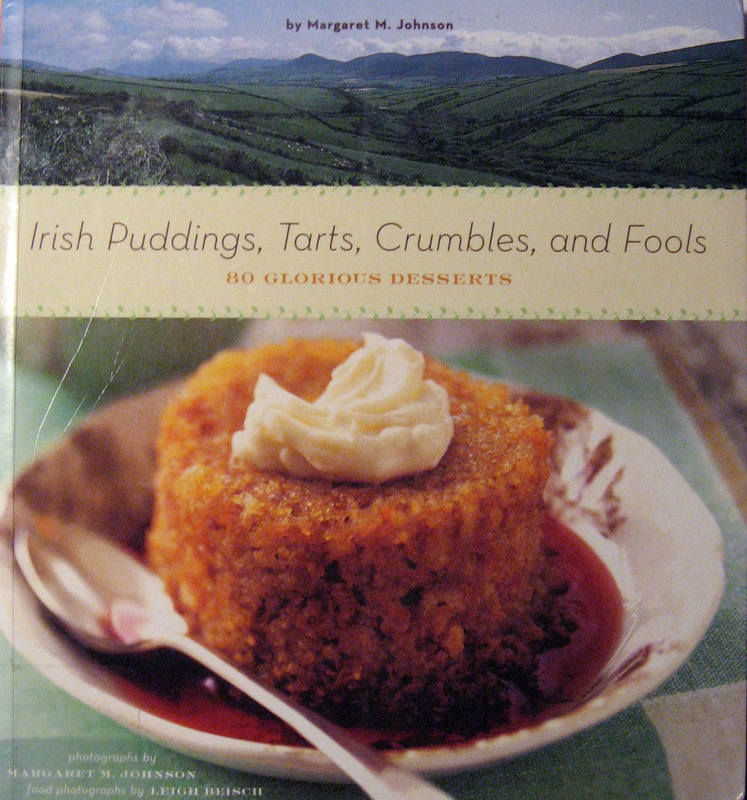 The first of the three books is Irish Puddings, Tarts, Crumbles and Fools: 80 Glorious Desserts. This book features recipes such as Bread and Butter Pudding, Queen of Puddings, Steel Cut Oat Pudding, Sticky Toffee Sponge Pudding, Rhubarb Tarte Tatin, Plum Tart with Oatmeal Crust, Blackberry-Almond Crumble Cake, Apple Fool, Lemon Syllabub, Lemon-Ginger Scones, and Christmas Pudding Ice-cream. I tried the Pear and Ginger Crumble which I found to be quite delicious. The aromatic yet delicate pears went perfectly with the sharp bite of crystallized ginger and, topped with a crumbly topping, made for a very "more-ish" dessert. Preheat the oven to 375F. Lightly butter a 9x13-inch baking pan. Filling: In a medium bowl, combine the pears and lemon juice. Stir in the sugar, crystallized ginger, and flour. Spoon into the prepared pan. Topping: In a medium bowl, combine the flour, oatmeal, brown sugar, cinnamon and salt. Add the butter, and stir with a fork until moist clumps form. Sprinkle the topping over the fruit. Bake for 45 to 50 minutes, or until the topping is golden and the pears are tender. Serve warm with whipped cream or vanilla ice-cream, if you like. 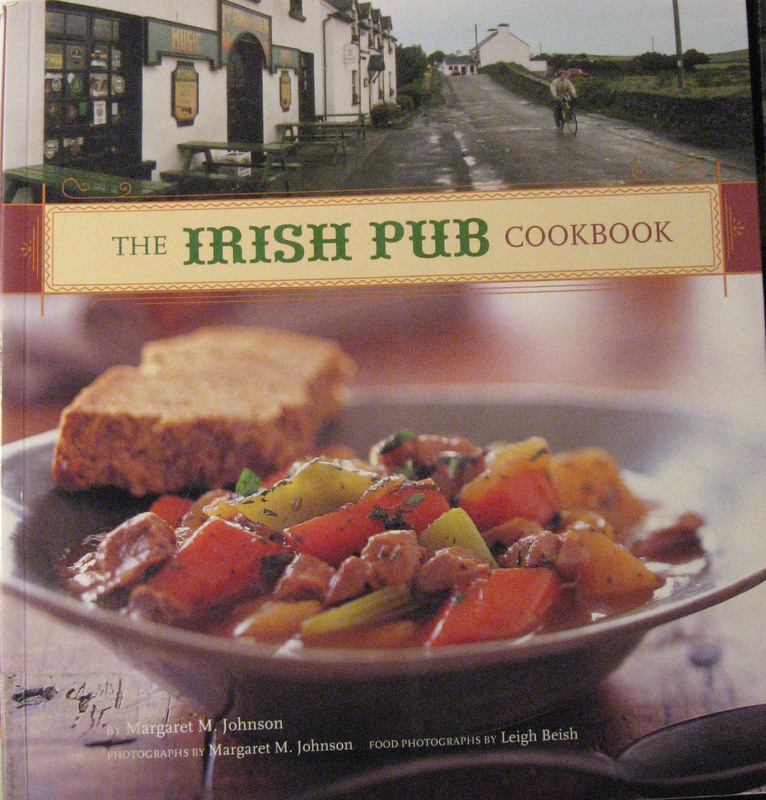 The Irish Pub Cookbook gives recipes for the kind of heart-warming food you would find in a typical Irish Pub. Chapters include: Starters, Soups, Salads, Hot Pots Meat Pies & Savory Tarts, Meat & Potatoes, Seafood, and Sweets. I found many of the recipes tempting; Salmon Cakes with Dill and Wine Sauce, Parsnip and Apple Soup, Bacon, Blue Cheese and Courgette Soup, Bibb, Bacon and Apple Salad, Ploughman's Lunch, Guinness Beef Stew, Bacon and Cabbage, Irish Cream Cheesecake, and Irish Chocolate Cake. I tried the Farmhouse Vegetable Soup which was delicious and down-to-earth with a distinct taste of parsnips. In a stockpot or large saucepan over medium heat, melt the butter. Add the onion and leeks, cover, and cook, stirring once or twice, for 5-7 minutes, or until the vegetables are soft but not browned. Add the parsnips, potatoes, carrots and stock or broth, cover and cook for 25-30 minutes, or until the vegetables are tender. Remove from the heat and let cool for 10 minutes. 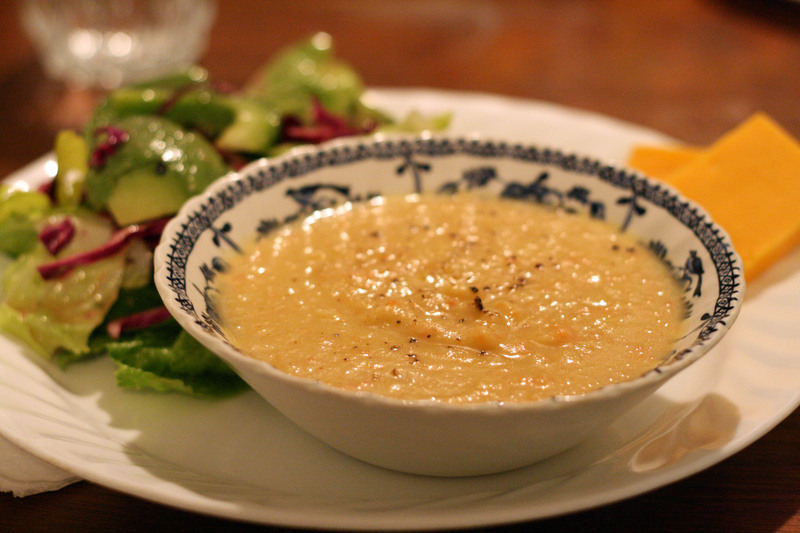 Working in batches, transfer the soup to a food processor or blender and puree until smooth. (Or puree in the pot with an immersion blender.) Return the soup to the pot, whisk in the half-and-half, and season with parsley, salt and pepper. Simmer until heated through. To serve, ladle the soup into shallow bowls. The New Irish Table: 70 Contemporary Recipes provides more of the same: beautiful photos, gorgeous food, and good recipes. The book is divided into Small Bites, Starters, Main Courses, Side Dishes, and Sweets. Scattered throughout each of these cookbooks are short explanations of various food items or recipes, helping to educate the reader on true Irish food. These books are a delight to look through and Johnson has done an admirable job of creating them. Those recipes all sound wonderful! Sorry but I have to ask, what is a "more-ish" dessert? We had the Pear and Ginger Crumble - it was great! and so much easier than peeling and slicing apples.